Happy cooks will prepare delicious food! Here are a few pictures of what we have been doing in Guatemala in December 2013! 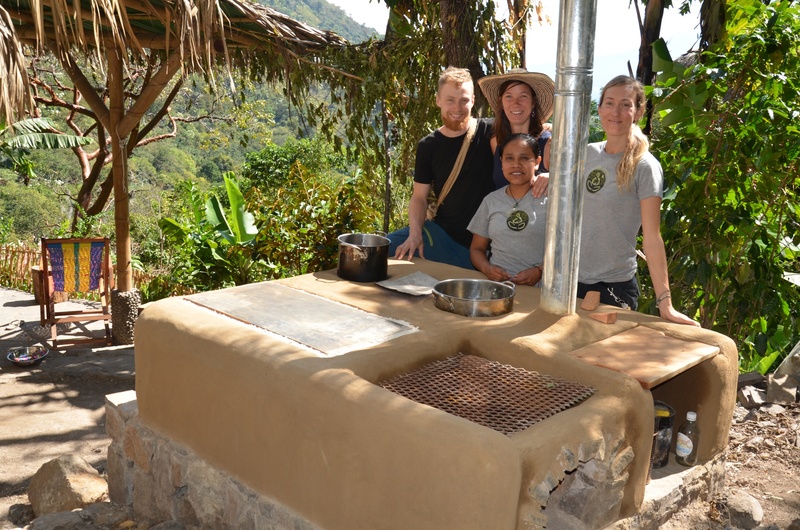 We built an outdoor kitchen consisting of a rocket stove island for cooking and and efficient barrel oven for baking. In the image above you see the rocket stove kitchen. We built the classic griddle stove for frying vegetables and making tortillas (left) and next to it a multi-pot rocket stove (back). The gases of the griddle stove pass by the multi-pot stove before exiting through the chimney and thus add more heat to the last pot before. Besides we added a grill and a wooden work surface. The stove is made out of local adobe bricks and covered with an earthen plaster. Stones for the foundation are from a nearby river and the platform was built by local guatemalans, who are excellent in working with stones! The cafe area at the Yoga Forest. The dry toilets have the best view you con possibly imagine! Permaculture principles are the main pillars in the development of the land. The new Yoga Shala within tropical vegetation! Beautiful sunrises every day are guaranteed! Malanga is a delicious root crop that grows in abundance! This is the site for the new outdoor kitchen! As for now, they only use a cob oven, which takes a long time and lot’s of wood to heat up. It’s great for pizza parties, but not for the daily cooking. This is a quick design of how the new kitchen is going to look like. The foundation is ready to go! Local rocks from the river and some cement. For the stove body we used left over adobes and mortared them with clay we found on site and some additional sand to avoid extensive cracking. Since the adobes were not the strongest, we decided to out a layer of firebricks as a last course. This is where the griddle is going to rest on. After building the stove body, we started with the combustion chamber. Ben was great help and after the course he felt confident to build a stove on his own! We built a classic Justastove (on the left) and a Multi-Pot Stove for several uses (right). The griddle is great for tortillas, frying veggies and meat and lot’s more. Finally the plaster ties it all together! We used clay, sand, horse manure and cactus juice! Frying veggies on the griddle. While Jeremy is cooking, I am giving the whole stove an additional protective layer called “aliz”, a natural based color made with wheat paste, fine sand and clay. Antony and Jeremy cooking. The locals build similar stoves themselves in their houses and are always curious about new techniques and ideas! This entry was posted in Appropiate Technology, Courses, Guatemala, Latin America, Natural Building, Outdoor kitchen, Rocket Stoves, Uncategorized. Bookmark the permalink.